I got kinda stuck with it. So I wanted to open it up and see what you thought. This is by no means original thought. This structure has been around for a while. (In fact does anyone knows who first came up with it?). The only new thing is relating it to visuals. And giving it a nice font. One interesting thing. 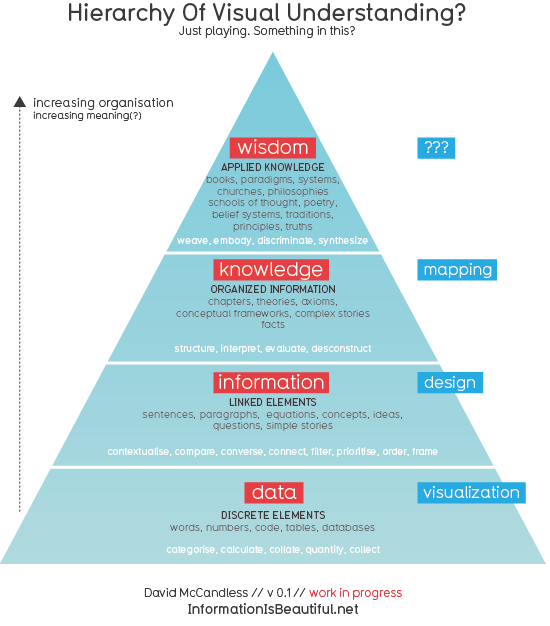 If you visualise information without designing it, you often end up with a mush or a meaningless thicket. So if you can only really ‘design’ information, rather than visualize it, then maybe the term ‘information visualization’ is a bit of a misnomer? Anyway, how does it look to you? Does it seem logical? Truthful? Do the definitions ring true? What could be the word for the visual depiction of wisdom? Does greater verticality imply greater meaning? Or can errors creep in? Look forward to your ideas, feedback and corrections!